I have one in stock at this price, a customer ordered the wrong length! Case-hardened Slip Yoke for use with a roller bearing extension housing. 3.5″ Shaft with, 1350 Series “Gold” Cryo treated Solid U-joints, are built under the most Stringent Tolerances in the industry. Tubing is Factory Straightened to .010″ total runout at the center of the tube. 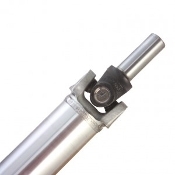 Tube yokes are welded to within .006″ runout on each end. The shafts are Electronically Computer Balanced to less than 1/8 Oz/Inch, as an assembly, assuring smooth operation at the Big end as well out of the hole. Critical Speed is calculated on each shaft to insure your Safety and Ultimate Shaft longevity. We recommend the 3.5″ shaft in most cases to 1000 Horse Power. 4″ Shafts are recommended to 2000 Horse Power. The shafts are given a brushed finish. Note that to get these measurements the rearend needs to be in the loaded position, as in when the vehicle is being driven. DO NOT take measurements if the rear is hanging down loose. How tight should I tighten my u-bolts? 1310 series and 1330 series should be tightened to 17 ft/lbs and 1350 series to 20 ft/lbs. You should never tighten the nuts on any u-bolt excessively. This will cause the cap to distort and the u-joint will fail prematurely.